Tonight’s the night to reflect on the past year and take note of the good, the bad, and the wonderful. And I’m so very grateful for the wonderful. I’ve been blogging for years about my “ah ha” moments and my personal growth and challenges, but I believe 2012 marks clearly the beginning of a new chapter in my life when I’ve finally brought into focus the crazy little thing called Love. While I’m sure I have barely scratched the surface of it, I have never stood amazed and awake in the presence of Love as consistently and as openly as I have in 2012. It’s not just a feeling for me – not something I do. It’s a state of beautiful serenity and joy and of choosing to have an open heart to embrace all the goodness that surrounds me, exactly as it is, with no expectations or demands for anything more. Love is exhaling the toxic selfishness and controlling nature out of my lungs and deeply breathing in both calmness and the pure exhilaration of being alive until my heart is swollen and ready to explode – until it becomes impossible to contain it within myself and it becomes a glowing radiance that makes its way into my eyes and my smile and transforms my face into a lovely stranger in the mirror. Gone is the agonizing pain and persistent fear I had during my marriage and for several years after. How did I live like that? And it wasn’t his fault – I see that now. I simply was incapable of staying with Love when I was constantly afraid he would leave me. Love and Fear do not mix. One cannot exist where the other lives. I was so afraid – afraid he didn’t love me, afraid I wasn’t enough, afraid of my power, afraid of my weakness. It’s been 7 years now, and I finally choose Love. Finally, I know what it feels like to open my heart for more than a fleeting moment – to fill up on Love and not be afraid of it. No longer am I scared of my power or my limits. I am capable of amazing things – things I never dreamed of. And most of my limitations exist only in my mind. I ran 1,265 miles in 2012. I ran at the Jersey Shore. I ran across NJ farmlands. I ran in a scorching drought in Indiana. I ran along the beach in Rhode Island with two dear friends and through the city of Philadelphia. I ran across tiny bridges and great big bridges. I ran through Washington, D.C. I ran through lush vineyards in rural Virginia. I ran under a big blue sky in upstate New York. I ran in the sleet, in the rain, and in the snow. I ran through parks and fields and alongside rivers. I ran with shoes; I ran barefoot. I even ran on treadmills. With every step I exhaled Fear and inhaled Love. My weeks and months of training runs were not just about running at all. I was unknowingly preparing myself for something much bigger than my next marathon PR. As if by magic, I somehow learned to transfer that spiritual experience from the road to the rest of my life. I get to practice every day. It’s a decision – a conscious decision to open up to Love, much like the choice I make to lace up my running shoes. 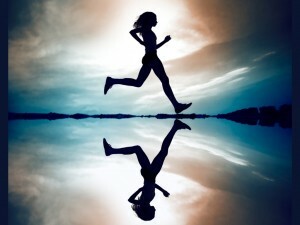 I am confident that on every run – every time I open up my heart – I will gain something beautiful from the experience. Running taught me how to Love. And in Loving, I am learning to Live.